More murals are popping up on area buildings around Cincinnati, and they're all among Artworks 2018 summer projects . The newest area targeted for sprucing up is Avondale. "This project is one project, but we’re actually executing three murals," Artworks program manager Linnea Gartin said. 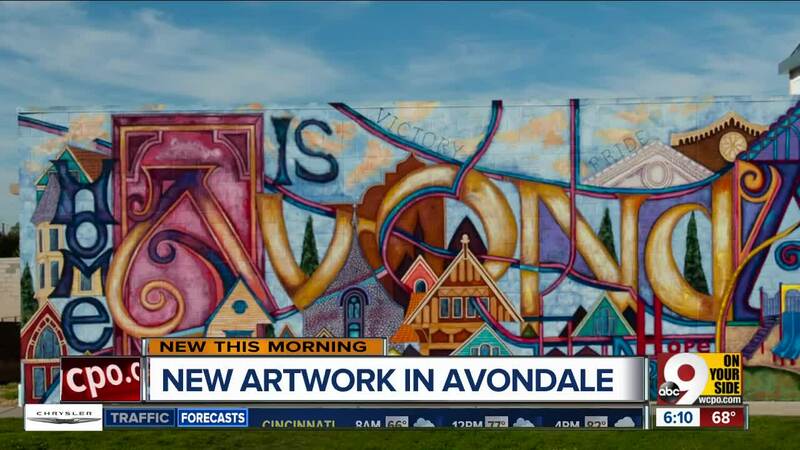 The three murals being created in the neighborhood will collectively be called "Avondale Pride." They will replace a previous "Avondale Pride" that had been erected in 2011. The Artworks team has employed around 12 youth apprentices, about half of whom are from the surrounding area, to work on the project. "We were approached by The Community Builders based on the demolition of our first mural to create new murals for the new town center," Gartin said. The new murals can’t be placed on the Avondale Town Center now because it’s still under construction, but they will be added later this fall. The artists are painting the murals on 250 panels made of parachute cloth. “Probably the hardest part is putting all of these individual panels together at the end and everything lining up,” Avondale Town Center Murals project manager Christian Dallas said. Many of the artists are novices or do artwork in other mediums. Project spokesman LaDe Richardson works usually works with paper instead of paint. “Right now, I’m blending so I’m getting used to blending the paint so it’s a good experience for me,” Richardson said. There will be another Avondale mural at Reading and Blair. It’s called "Avondale Heroes," and it will show images of community leaders. Most of the murals will be completed by the beginning of August. "Avondale Heroes" will be finished mid-month.